DUBUQUE — On Dec. 7, members of a local assembly of fourth degree Knights of Columbus will put on their distinctive regalia attire – with capes and swords and plumed “chapeau” hats – and they will gather at Loras College’s Christ the King Chapel to remember their namesake on the 75th anniversary of his death. 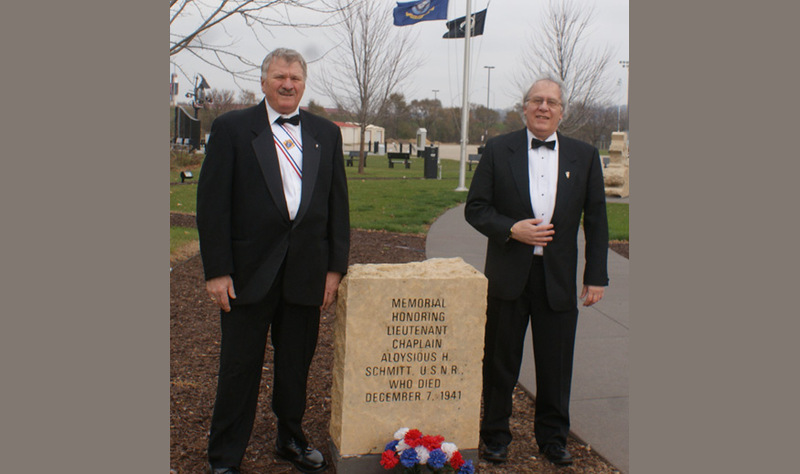 The Chaplain Aloysius H. Schmitt Knights of Columbus Assembly #3556 will provide the honor guard for a special Mass of remembrance for Father Al Schmitt, a native of St. Lucas and graduate of Loras, who was killed during the 1945 attack at Pearl Harbor. This is the first year the Knights have organized a memorial Mass, but they hope it will become an annual event. This year’s Mass carries extra significance since Chaplain Schmitt’s remains were just recently identified and were interred in the Loras chapel this October. 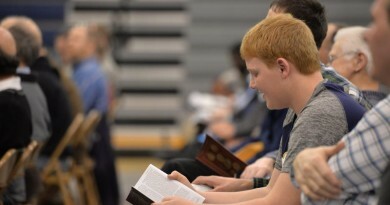 The Knights’ Chaplain Schmitt Assembly was established on May 1, 2015. It consists of three separate Knights of Columbus (KC) councils – one from St. Joseph the Worker Parish, one from nearby St. Columbkille Parish and one from Loras College, all in Dubuque. 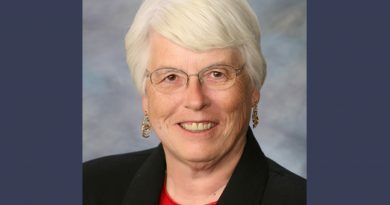 Steve Hesprich, who leads the assembly in a position titled the “faithful navigator,” said naming their assembly after Chaplain Schmitt seemed like a natural fit. “A member from the St. Joseph the Worker council, a former Naval guy, suggested it. The idea was well liked. It made sense with our emphasis on patriotism,” Hesprich said. There are four principles associated with the Knights of Columbus – charity, unity, fraternity and patriotism. Each degree of the Knights is associated with one of those principles; the fourth degree is known as the patriotic degree. Earlier this year, with the 75th anniversary of Chaplain Schmitt’s death soon approaching, the Knight’s assembly decided to work with officials at Loras to organize a special Mass in his honor. Hesprich said he and other Knights became aware of the military’s efforts to identify Chaplain Schmitt’s remains after reading about it in an article in The Witness in January. “We were hoping they would identify him and bring him back before the event on Dec. 7, and our prayers were answered, and they did,” he said. 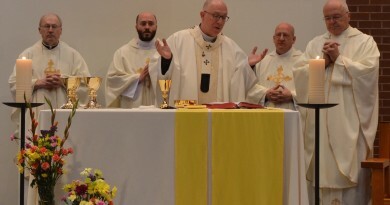 Father Dennis Miller, Loras College’s chaplain and a member of the school’s fourth degree Knights of Columbus assembly, was one of the individuals instrumental in planning the Mass for Chaplain Schmitt. The priest said he had learned about the life and death of Chaplain Schmitt a decade ago, while visiting the cemetery in Hawaii where his unidentified remains and those of others killed at Pearl Harbor were buried. He was shown around the cemetery by Father Andrew Lawrence, a chaplain from the Archdiocese of Dubuque, who shared with him how Chaplain Schmitt had died saving the lives of 12 men when their ship was hit by Japanese torpedoes. Father Hilary Aidoo, the sacramental priest at St. Joseph the Worker and St. Columbkille Parishes, serves as the chaplain, or “friar,” for the Chaplain Aloysius Schmitt Assembly. Father Aidoo said he is looking forward to the Dec. 7 Mass and believes it is very appropriate for the KCs to recognize such a man as Chaplain Schmitt. The Mass at Loras will be held at 6 p.m. and is open to the public. Archbishop Michael Jackels will be the main celebrant. Fathers Miller and Aidoo will also be part of the Mass, as will Father Gabriel Anderson, the pastor of St. Joseph the Worker and St. Columbkille Parishes. Several past military chaplains from the archdiocese also hope to be present. The chalice that will be used during the Mass was one that had belonged to Chaplain Schmitt and was recovered from the wreckage of the USS Oklahoma following the attack on Pearl Harbor. The Mass will be followed by a reception in the Loras College student center. In addition to the Mass on Dec. 7, Chaplain Schmitt will also be honored at a Knights of Columbus event this spring. 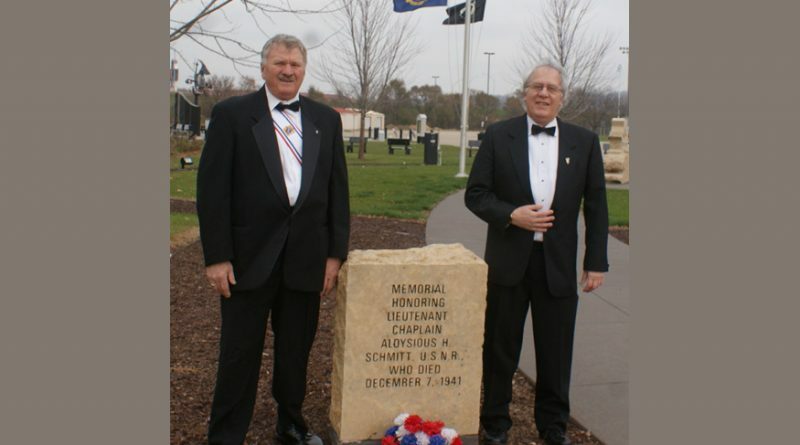 The Iowa State Convention for the Knights of Columbus will be held at the Grand River Center in Dubuque April 7-9. Chaplain Schmitt will be the honoree at the exemplification ceremony at the gathering on April 7. ← The kingdom of heaven is at hand!